Parkland's mission to keep our community healthy extends well beyond the hospital. Our population health programs and health centers provide the right care, at the right time and place for those who need it most. About 1 million residents in Dallas County are uninsured or on Medicaid. Quality of life suffers and precious lives are lost without early intervention for illness and preventative care services. The demand for care continues to increase and our patients have unique barriers to care – language, child care issues, low levels of literacy, lack of transportation – which can result in devastating outcomes for patients and families. Now more than ever, there is a need to keep residents healthy and out of the hospital, leveraging research and technology to improve education and early intervention. Parkland is invested in the health and well-being of the Dallas County community. In 1987, we pioneered the Community Oriented Primary Care (COPC) program to offer affordable, comprehensive, and conveniently located medical care throughout Dallas neighborhoods. Through our comprehensive range of services we provide patients with a medical home – a place where they can work with their medical team to achieve the best health possible. Our patients are encouraged to build strong, long-term relationships with their doctors and other care providers. 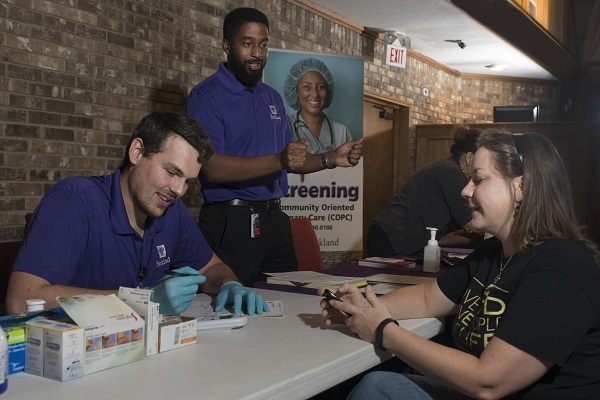 With 12 primary care clinics, 12 school-based clinics and five mobile vans, our network of community clinics provide high quality, affordable and accessible medical care throughout Dallas County. The health centers offer primary care for children, adolescents, men, women and seniors. Supporting population health at Parkland helps keep Dallas healthy. Your gift will help the most vulnerable in our community receive the care they need.